This letter was written by 28 year-old William N. Salter (1834-1863). He was probably the son of Uriah and Mary Salter and, if so, he had several younger sisters — Phebe M. Salter (b. 1837), Harriet L. Salter (b. 1839), Sophia Salter (b. 1843), Caroline Salter (b. 1846), and Amy Salter (b. 1850). He may have been the same William Salter who was residing in Stonington, New London, Connecticut in 1860 with a wife named Lucy and a daughter named Jane (b. 1853). This William Salter was employed as a Railroad Engineer. 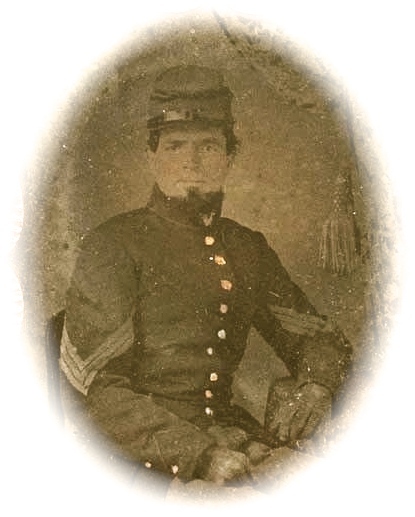 William was mustered into Co I, 10th Connecticut Infantry, as a corporal in October 1861. The 10th Connecticut participated on the Burnside Expedition to North Carolina in early 1862. This letter was written from New Bern where we learn that the 10 Connecticut had been encamped for some three months. In January 1863, Salter was promoted to sergeant and the regiment was transported from North Carolina to St. Helena Island, off the coast of South Carolina. In July, the 10th Connecticut participated in the assault on Fort Wagner by creating a diversionary action. In October, they were transported to St. Augustine, Florida, which was the end of the line for Sgt. Salter. He died of chronic diarrhea on 23 December 1863 in St. Augustine, Florida. William wrote the letter to one of his sisters but he does not state which one. With pleasure I write you in reply to yours of the 14th & was glad to hear from you once more as I have not had the pleasure of receiving a letter from you in a long time before. I wrote you letters that you have not received as far as I can learn. You live so far from the [Post] Office that you do not receive them in some time after the letters arrive at the Office. This evening as I look up toward the sky, the clouds looked so beautiful [in] the rich & beautiful sky, & all their gold edges with silver-colored base. How beautiful is the work of God in all things, in green grass as well as the dark & stormy sky. And how good has he been to me to preserve my life & permit me to return to my family & there remain until fully recruited from my illness. And now, by the blessing of our Father, I am now with my regiment again. I found the regiment encamped on the same ground that was occupied by them before I was taken sick & it was nearly two months that I was home & more than two months — yes, very near three. I was down to the city the other day & saw George Bodin & Frank Pregmore & Davies W. Williams. He is how in the Quartermaster Department — clerk, I believe. And George has sent for his wife & daughter & Aunt Margret & they also have sent a pass for Uncle Edwin. And Ed Lonan is Harbour Master at this place. And Hanckerson Williams is now at Beaufort & there is Head Steavedore. I am glad that Father called to see you & I should loved to have called upon you but I could not for my strength would not allow me to get so far from home. And Mary was not at that able to go but a little way at a time for she could not stand but little exercise. And when I left home, she was not well at all & I assure you, I was troubled about her health but I was obliged to return to my regiment as all men was ordered so to do. And I was received by them with pleasure & all anxious to hear from home. I saw Mary’s aunt that lives at Tom’s River in the city when we were down. Now it is time for roll call & I must go as the drum has beat. After roll call. Now you must not wait so long before you write me again. I received a letter from my wife & also from father. I felt much worse at leaving home the last time & if I only am well & also my wife, I want no furlough unless on the account of sickness. Now I must bring my letter to a close. We have but few men here for Burnside has taken all the men from here but the First Brigade & some artillery & cavalry & we may more of us leave here. Today our men took one prisoner that escaped & he was found back in the swamp. The health of our soldiers are very good at present. We hear from the Rebels pickets sometimes but do no harm to us as yet. Some shots exchanged & two or three men wounded. Today is beautiful here — like spring morning & last evening we had thunder showers. I have just closed a short letter to Harriet & Carrie & gave them a short description of my exposures in our last three battles. We were gone from camp 10 days and fought three battles and returned to camp after burning the bridge near Goldsboro. The bridge is called Tomkins Bridge and tore up the track on the R. R. and captured a rebel mail. In the first Battle at Kingston, we went into the field with 366 men and lost 104 killed and wounded. Our loss in the other battles were nothing but our whole loss was one fourth of all the loss while gone. I, while in the battle, was somewhat excited & our regiment marched over two other regiments — one was 103 New York & 45th Mass Regt. As we came through a thick swamp, there they lie, and we marched over them to form our line just in their front, and then we commenced our fire. The other regt. lie close to the ground, I tell you, & sometimes they would fire a shot. But as soon as we commenced fire, we received a deadly fire from the Rebels from direct in front and also a cross fire, and the cross fire is what done us the most damage. I do not see how we lived under such hot fire but God protected us. Under such fire we fought about one hour & a half & then we charged on the demons & away they ran across the bridge & then on the opposite side of the river they had rifle pits & from there they shot a number of our men & officers & we took a number of prisoners. Our regiment was first to make the charge & alone & one of our corporals in Co A took one prisoner — the color bearer — & got the sesesh color & laid it down for something & what I don’t know & just at that time the honorable Colonel of the 9th New Jersey Regt. ordered some of his men to take it & he did & in that way the 9th New Jersey got the colors. Our men saw him ride off with it after seeing his men hand it to him. We was the first to charge & our colors were the first on the rebel breastworks & our boys with artillery buckets put out the fire on the bridge. And here on this bridge was the most heart rending sight I ever saw. Two men lie there on the bridge burned to death — or nearly. One was dead and his face burned to a coal, & the other burned so the flesh fell from his ribs and his bones bare & he still gasping. The sight was awful. The Rebels threw a number of their dead in the river from off the bridge. The Rebel loss, I do not know. We killed one Colonel or Major & took the Colonel prisoner. He was wounded. I cut off two buttons off of the dead major’s coat and now wear one on mine. I came very near being killed with a shell. It landed just in front of me and bounded over me but did not burst & so I could not see for sometime & soon after a man came crawling upon his hands & knees & asked am I dead. I told him not yet. Such is war! This entry was posted on Wednesday, April 15th, 2015 at 8:42 pm	and posted in Uncategorized. You can follow any responses to this entry through the RSS 2.0 feed. I recently purchased the letter you describe as #2 from William Salter. Do you know the whereabouts of letter #1? Thanks. I saw the transcription of it, but wondered if you knew where the actual letter is. I would have liked to have both of them, but I’ll settle for the one I have. It’s a great letter.